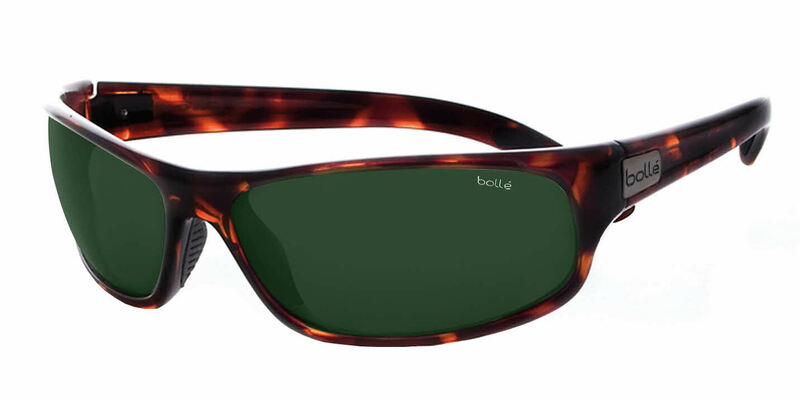 Bolle brand sunglasses have been around since 1888 and over the years they have mastered the craft of sunglass design. These functional, stylish and economical viable frames are the best choice for athletes looking for an affordable and reliable choice in eyewear. Recognized in print and media, Bolle eyewear is setting the bar high for sport eyewear all over the world. Check out this great collection and all of the other amazingly versatile and awesome Bolle frames & goggles. The Bolle Anaconda Prescription Sunglasses are one of the most popular Bolle frames available today, their construction has functionality in mind, and fashion by design. Specialty nosepads and temple tips are designed to increase grip even when face with sweat. Saddle bridge for added comfort. Plastic frame adds comfort and durability. Variety of frame color options to help personalize your Bolle Anaconda Prescription Sunglasses. Bolle emblem is featured on the temples. A large variety of lens color options available as well, to suit whatever lighting conditions you may be faced with. See also: Bolle Eyeglasses, Bolle Sunglasses, Bolle Kids, Bolle Goggles, Bolle Sport & Bolle Prescription Sunglasses. I ordered these with the TNS Fire (polarized w/AR) lenses and couldn't be happier. The key to be satisfied is all about choosing the proper sized frames and the Anaconda was a perfect fit for me. I'm very happy! The one star rating is for the color. The frames appear to be solidly made and should last a long time. Blue is my best color, so it's my first choice when shopping for accessories. When the glasses arrived, I was surprised to see that I'd been shipped black frames. The fit and prescription were both perfect, but the color was odd - in some light it appeared totally black, and in other brighter stronger light - it looked like there could be a hint of blue. I ended up returning these because the color was not a true blue. Even FD customer service had to try different lighting to see any blue in these... and now based on that experience, looking at the product picture, can kind of see that effect - but the product picture shows way more blue that you'll get in reality. Shame on Bolle for this terribly ambiguous color. FD customer service was stellar through the return process. I have a new pair on their way to me in dark tortoise shell. These should be great, but still a little sad that my first choice color didn't work out. My experience with Frames Direct was excellent in every way and I love my new glasses. Excellent product with unbelievable visual clarity using Trivex lenses. Frames Direct has always done a fabulous job for me. Excellent! Very durable & fit well. Great for skiing, riding & work. The wrap keeps things out of my eyes. This was my 2nd pair.